I wanted to like this more than I did. For deep autumn, a book about ghosts, a famous cemetery, and rainy London sounded like a good read for chilly nights under the covers. And I did enjoy the first 2/3 of the book, but in the end, it all just fell apart into silliness and mere plot hijinks, rather than delving into the characters motivations. 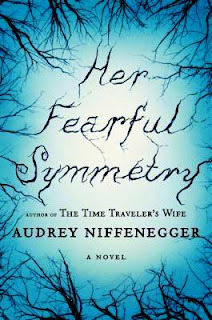 Like a whole lot of people, I read and truly loved the author's bestselling The Time Traveler's Wife (but had no interest in seeing the movie), so I was prepared for a certain amount of the fantastic and magical -- where Time Traveler has a man who jumps through different decades of time as the main character, this novel has a lonely, bored ghost as a central figure. Eventually the ghost becomes powerful enough to make herself known to her 2 American nieces, to whom she's left her large, drafty apartment in her will. The rule is that the nieces, who are twin sisters, must live in the apartment for a year before they decide to sell or keep the property -- and that their mother, the ghost Elspeth's twin sister, can never set foot in the flat. Why Elspeth has been estranged from her own twin for decades is the novel's central mystery. Highgate Cemetery. Image from here. Complicated enough? The dynamic between the two living twins, Julia and Valentina, is interesting and has plenty of tension, but I wish Niffenegger had spent much more time on the actual relationships, rather than indulging in so much ghostliness. For me, this was never a true horror story, or the least bit spooky or creepy. Well, unless you consider Elspeth (the ghost) accidentally killing a little white kitten, then managing to bring it back to life by "stuffing" its soul back into its limp little corpse, creepy. So...not too creepy. 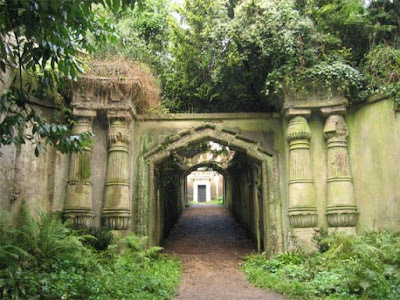 I liked the secondary characters a lot more than any of the main ones, and enjoyed the descriptions and history of the real Highgate Cemetery in England, but in the end, I wanted something more substantial than a pissy, bitter ghost and two feckless young Americans to keep me company on a November's night.